Christmas isn’t even here yet, but I’m already worrying about leftovers. I justify this to myself by saying that I like to plan ahead, but maybe I should be enjoying the moment. In any case, I ALWAYS have leftover mashed potatoes after holiday meals, so I was thrilled to find a hundred-year-old recipe for Potato Croquettes that calls for mashed potatoes. The Potato Croquettes had a crispy crust filled with a delightful spicy mashed potato mixture flavored with paprika, cayenne pepper, celery salt, parsley, and onion. Place the shortening into a frying pan, and heat until hot. (There should be about 1/2 inch of melted shortening. Add more if needed.) Drop balls into the hot shortening, then gently roll the balls with a fork until all sides are a light brown. Remove from heat and drain on paper towels. When I made the recipe I used 1/2 teaspoon of salt rather than the 1 teaspoon called for in the original recipe. I also used chopped onion rather than onion juice. The recipe turned out fine with these substitutions. Posted on December 24, 2017 December 23, 2017 by SherylPosted in FoodTagged potato, recipe. I can assure you these are delicious, real comfort food. My spicing isn’t quite the same – I go for cumin rather than minced onion, but it’s the sort of thing you can easily adapt to your own tastes. Happy Christmas! Enjoy using those leftovers! It would be easy to adapt this recipe depending upon tastes. I seldom use cumin, but your comment makes me think that I should give it a try. Sometimes I think that I get into a rut, and tend to just use the same few spices. Oh, don’t we all! Happy new year. I never have leftover mashed potatoes, because I never have mashed potatoes. However. These look good enough that it might be worth cooking some potatoes. The thing to do would be to cook a lot of potatoes, mash them, and then freeze them in meal-sized portions so they’d be ready for recipes like this. Sounds like a good idea. I’ve never tried freezing mashed potatoes, but it seems like it that it would work. I grew up eating these! Wish I had one right now. It’s a nice old-fashioned comfort food. I’m with you, I always have leftover mashed potatoes, too. I’ll have to make these with mine! It’s a nice way to use left-over mashed potatoes. I hope that you had a wonderful Christmas. Happy New Year! Thank you, Sheryl. Happy New Year! Yum! I just finished lunch, but now I’m hungry again! I can’t wait to make these! They are just my cuppa! Anything fried with potatoes (except French fries) I love! I’ve already printed . . . . . I think that you will like this recipe. I’m gonna have to do lots of mashed potatoes in hope I have some left… with growing grandsons who are at that age ,where they will eat you out of house and home, my left overs the last few days have been very little! You must be a good cook it there are few left-overs. I wish I had time for this recipe! I’ve only once prepared mashed potatoes, and that was this past Thanksgiving. It will probably take me a year to work up to this one. Personally I find making the mashed potatoes easier than making and frying the croquettes. We might do well working together! Making that recipe could be a team endeavor. This recipe reminds me of the potato patties my Mom used to make. They were delicious. My ex mother-in-law made these on the rare occasion when she had left over mashed potatoes and I always enjoyed them! I’m ready to try them soon – these seasonings sound like a wonderful combination! The seasonings add a nice dimension to this recipe. I always thought celery salt was a relatively modern ingredient but there it is in a 100 year old recipe! I’m often surprised by how many “modern” things they had a hundred years ago. Thanks for the tip. I occasionally get to Watsontown, and have eaten at Ciro’s, but I don’t think that I’ve ever tried their potato croquettes. The potato croquettes remind me of my mother. She would always make them after Thanksgiving and Christmas. I hope you had a wonderful Christmas. It’s nice to hear that this post brought back some good memories. I had a lovely Christmas. Happy New Year! Yummy, I could go for some crunchy potatoes right now! 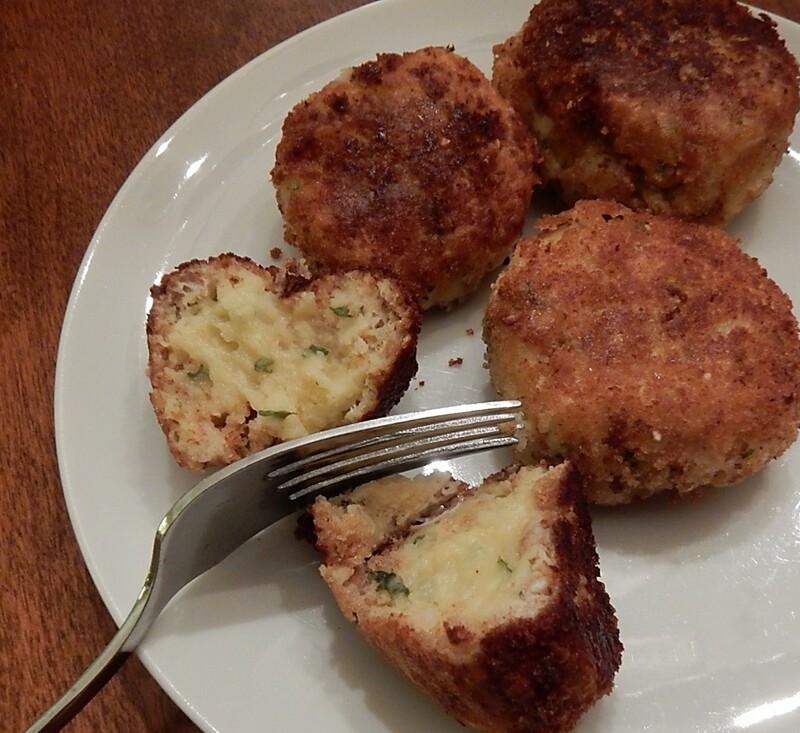 These croquettes looked so delicious & that is why, I made them 2 times! Perfect every time! 🙂 So delicious! It’s nice to hear that you’ve enjoyed this recipe. My mother used to make these and I still make them yours look so good and crispy definitely using this recipe and deep frying!